"To put it bluntly, President Trump’s leadership is working; and China wants a different American president," Pence said in a speech. The vice president, using unusually harsh terms, also said Beijing continues to engage in the theft of American technology and intellectual property. China also is guilty in widespread human rights abuses against religious minorities, including a countrywide crackdown on unofficial Christians and mass repression against Muslim Uighurs, Pence said in a major policy address on China. The vice president also urged Google to cancel work on a search engine that is designed to support Chinese government censorship of the internet. "For a time, Beijing inched toward greater liberty and respect for human rights, but in recent years, it has taken a sharp U-turn toward control and oppression," Pence said. Pence also blamed the Obama administration for ignoring and in some cases abetting China's efforts to expand its strategic interests around the world. "But those days are over," he said, adding that Trump is committed to defending American interests. At the White House, National Security Adviser John Bolton said the Chinese influence threat is "a very serious problem." "And I think the American people are a very independent lot," he said. "I don't think they want other people interfering in our decision-making process." Bolton sidestepped a question about the reported discovery on American computer parts of very small chips placed by Chinese suppliers that facilitated cyber espionage. But he noted: "The Chinese efforts to threaten us in cyberspace and across the information technology spectrum, are a very high priority for us. Countering them, establishing structures of deterrence to prevent China from even thinking about doing it." The comments on Chinese influence operations aimed at subverting U.S. elections expanded on similar remarks by Trump at the United Nations last week. "Beijing is employing a whole-of-government approach, using political, economic, and military tools, as well as propaganda, to advance its influence and benefit its interests in the United States," Pence said. "China is also applying this power in more proactive ways than ever before, to exert influence and interfere in the domestic policy and politics of our country." Pence said his comments were based on open source and recently declassified intelligence information. The vice president quoted one senior U.S. intelligence official as saying "what the Russians are doing pales in comparison to what China is doing across this country." The hardline posture toward China reflects the Trump administration's new national security strategy issued in December that recognized China as an adversary for the first time in several decades. Until the election meddling and influence operations were disclosed last week, most of the administration's tougher posture toward Beijing was limited to trade and economic issues. The administration has imposed more than $200 billion in tariffs on Chinese goods in recent weeks aimed at pressuring Beijing to curb unfair trade practices and technology theft. Pence said an additional $200 billion in tariffs could be imposed. Pence said China's political influence operations are aimed at undermining support for Trump as a result of U.S. economic pressure that has forced China's largest stock exchange to fall by 25 percent this year. Instead of pursuing trade policies that are free, fair, and reciprocal, China's rulers are "pursuing a comprehensive and coordinated campaign to undermine support for the president, our agenda, and our nation’s most cherished ideals." The Chinese operations seek to achieve Beijing's objectives using propaganda and influence operations in "more proactive and coercive ways to interfere in the domestic policies and politics of the United States," Pence said. "The Chinese Communist Party is rewarding or coercing American businesses, movie studios, universities, think tanks, scholars, journalists, and local, state, and federal officials," he said. "Worst of all, China has initiated an unprecedented effort to influence American public opinion, the 2018 elections, and the environment leading into the 2020 presidential elections," he said. The operations show U.S. policies toward China are working and that China is seeking a different U.S. president. "Our intelligence community says that ‘China is targeting U.S. state and local governments and officials to exploit any divisions between federal and local levels on policy. It’s using wedge issues, like trade tariffs, to advance Beijing’s political influence,'" Pence said. Internally, Beijing in June published a sensitive document called "Propaganda and Censorship Notice" that orders state-run media to "strike accurately and carefully, splitting apart different domestic groups" in the United States, Pence said. "To that end, Beijing has mobilized covert actors, front groups, and propaganda outlets to shift Americans’ perception of Chinese policies," he said. "As a senior career member of our intelligence community recently told me, what the Russians are doing pales in comparison to what China is doing across this country." Senior Chinese officials also are seeking to influence American business leaders to condemn Trump's trade actions by leveraging their desire to continue doing business in China. One major U.S. corporation was threatened with the denial of a business license if the company refused to speak out against administration China policies. Regarding the mid-term elections, China is trying to influence the outcome by targeting its retaliatory tariffs to U.S. industries and states that would play important roles in the upcoming elections. "By one estimate, more than 80 percent of U.S. counties targeted by China voted for President Trump in 2016; now China wants to turn these voters against our administration," Pence said. China also is using paid advertisements, like the multi-page insert in the Des Moines Register in the pivotal election state of Iowa. The supplement, disguised as a news article, "cast our trade policies as reckless and harmful to Iowans," the vice president said. In addition to seeking to influence policies and politics, China is pressuring American corporation seeking to do business in China. Beijing is demanding that American joint ventures set up Communist Party organizations within the companies that will give the Party a voice and possibly a veto over hiring and investment decisions. China also is threatening American companies over identifying Taiwan as separate from China or for not following China's policy on Tibet. For example, Beijing forced Delta Airlines to publicly apologize for not describing Taiwan as a province of China on its website. Beijing also forced the Marriott hotel chain to fire one of its employees who "liked" a tweet about Tibet. Pence also noted China's pressure on Hollywood to force movie studies to portray China in a favorable light. "Beijing’s censors are quick to edit or outlaw movies that criticize China, even in minor ways," he said, noting the film "World War Z" was forced to cut out a mention of a computer virus originating from China and to digitally alter the identifying of foreign troops in the remake of "Red Dawn" from Chinese to North Korean. Television Network—that was recently required to register as a foreign agent by the Justice Department. China has imprisoned Chinese family members of American journalists and blocked websites of U.S. media. The Chinese also are influencingAmerican academia, using more than 150 branches of a front called the Chinese Students and Scholars Association on American campuses. China is funding universities, think tanks and scholars in order to prevent them from criticizing the Communist Party of China. And experts are manipulated into towing the Party line through denying visas to academics critical of Beijing. 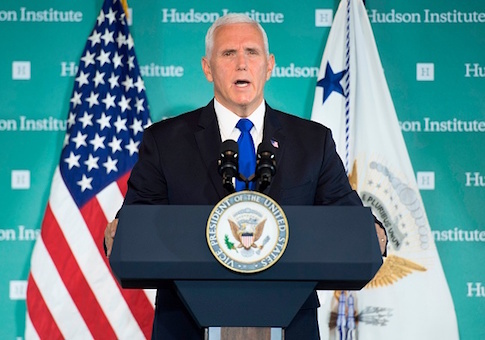 Pence spoke at the Hudson Institute, which he said was the target of a Chinese cyber attack over its plan to host a meeting by dissident Chinese billionaire Guo Wengui. The vice president failed to mention that Hudson was pressured by China into cancelling the Guo meeting a day before it was to be held by threatening to block visas to China for Hudson scholars. "These and other actions, taken as a whole, constitute an intensifying effort to shift American public opinion and public policy away from the America First leadership of President Donald Trump," Pence said. "But our message to China’s rulers is this: This president will not back down—and the American people will not be swayed. We will continue to stand strong for our security and our economy, even as we hope for improved relations with Beijing." Pence vowed to continue tough action until Beijing ends the theft of American intellectual property and stops forced technology transfers. The administration also is strengthening the Treasury Department-led Committee on Foreign Investment in the United States to block predatory Chinese actions in buying into U.S. markets. Since the early 1990s, the United States assumed a free China was "inevitable," Pence said, and as a result opened up the U.S. economy to China and allowe it to join the World Trade Organization despite its non-market system. Pence said the engagement policy was a mistake. "Previous administrations made this choice in the hope that freedom in China would expand in all forms—not just economically, but politically, with a newfound respect for classical liberal principles, private property, religious freedom, and the entire family of human rights," he said. "But that hope has gone unfulfilled." Freedom "remains distant for the Chinese people, and while Beijing still pays lip service to reform and opening, Deng Xiaoping's famous policy now rings hollow," he added. American investment in China over the past 17 years helped China's growth to skyrocket as a result of American investment. However, the ruling Chinese Communist Party employ an "arsenal of policies inconsistent with free and fair trade, including tariffs, quotas, currency manipulation, forced technology transfer, intellectual property theft, and industrial subsidies doled out like candy, to name a few," Pence said. China's current trade deficit with the United States was $375 billion and China has an internal plan to control 90 percent of the world's most advanced industries, including robotics, biotechnology, and artificial intelligence. To achieve that goal, China is seeking to gain American intellectual property by all means—including requiring American businesses to give up trade secrets and buying American companies. "Worst of all, Chinese security agencies have masterminded the wholesale theft of American technology—including cutting-edge military blueprints," Pence said. "And using that stolen technology, the Chinese Communist Party is turning plowshares into swords on a massive scale." Pence said China is using its newly modernized military forces to push the United States out of Asia and prevent supporting American allies in the region. "Beijing is also using its power like never before," he said. Pence also suggested that Chinese President Xi Jinping lied during a White House meeting in 2015 in stating China would not militarize South China Sea islands. "Today Beijing has deployed advanced anti-ship and anti-air missiles atop an archipelago of military bases constructed on artificial islands," he said. Pence said the encounter Sunday between a Chinese warship and the guided missile destroyer USS Decatur in the South China Sea was "aggression" and "reckless harassment" that nearly caused a collision. "America had hoped that economic liberalization would bring China into greater partnership with us and with the world," he said. "Instead, China has chosen economic aggression, which has in turn emboldened its growing military." Chinese internal repression today rests on what Pence described as "unparalleled surveillance state" that is increasing and has been assisted by U.S. technology. "By 2020, China’s rulers aim to implement an Orwellian system premised on controlling virtually every facet of human life—the so-called ‘social credit score,'" Pence said. Persecution of Christians, Buddhists, and Muslims is also reaching new levels in China. China shut down one of China's largest underground churches last month and has begun tearing down crosses, burning Bibles, and imprisoning believers. The Vatican also has permitted the avowedly atheist Communist Party to play a direct role in appointing Catholic bishops. "For China’s Christians, these are desperate times," the vice president said. Also, in the past decade over 150 Tibetan Buddhist monks have lit themselves on fire in protesting Chinese repression in Tibet. And more than 1 million Muslim Uighurs have been imprisoned in government camps where they are subject to constant brainwashing, Pence said. Economically, China is using "debt diplomacy" in the developing world to expand its influence and control in Asia, Africa, Europe, and Latin America. The economic control has security implications. Pence said China pressured Sri Lanka into turning over a commercial port in Hambantota that "may soon become a forward military base for China’s growing blue-water navy." This entry was posted in National Security and tagged China, Mike Pence. Bookmark the permalink.